In the latest issue of CA News, this piece of Peter Tully's popped up toward the end of the newsletter. 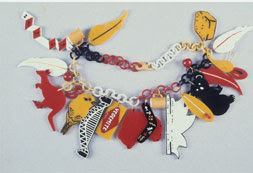 From 1980, the piece is entitled 'Australia Belt' coming at the end of about ten years or so of work in which Tully had worked with Jenny Kee and Linda Jackson producing sardonic takes of Australiana, gloriously embracing kitsch, punk, queer and the venal vernacular. 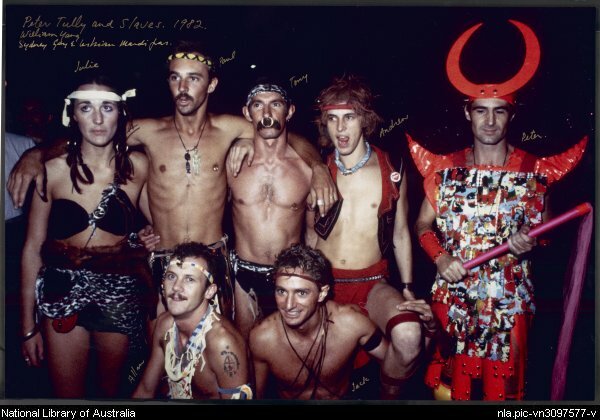 But Peter is perhaps best known for his Gay & Lesbian Mardi Gras costumes of the early 1980s onward, a couple of which the Powerhouse Museum has amongst its Mardi Gras ephemera. He managed, well he set up the Mardi Gras workshops from 1983 til 1986. 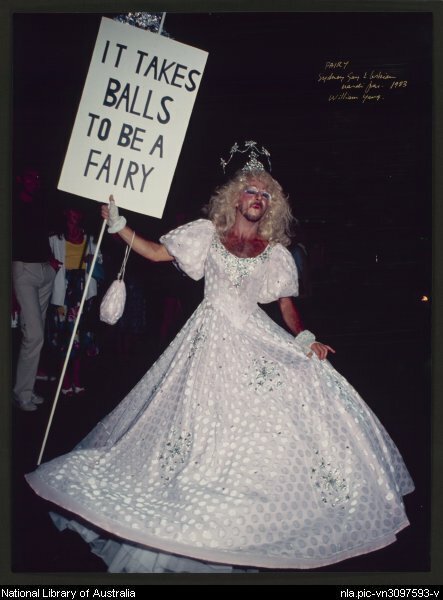 This was taken by William Yang at the 1981 Mardi Grass. It had progressed from a running battle with police in its first year but had not yet evolved into the community celebration it was to become. 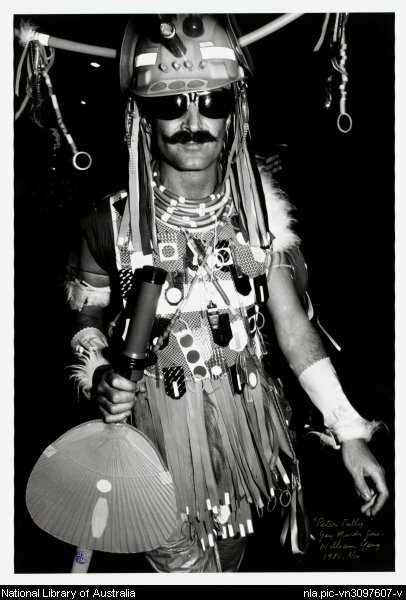 As Yang remarked, Peter Tully's costume was "by far the most spectacular costume". Homosexuality between consenting males was still illegal in NSW at the time. But the most remarkable of all would have to be the 1990 costume - I can only locate the catalog image from the Powerhouse Museum but it has the benefit of being a high quality image plus a zoom facility. Two years later, Tully was dead, one of the millions of people to die of an AIDS related illness since the beginning of the pandemic in the late 1970s. Four years before, Eric Michaels had also died prematurely from the same disease. Michaels, the New York Jewish gay urban cowboy anthro who had spent years out with the Warlpiri at Yuendumu who had begun to write a cultural anthropology every bit as audacious and exciting as Tully's design work. A voice from across the room laconically answered, "They're all dead darling."